Most of us have a love-hate relationship with crowds. They can be terrifying, but they can also be great reservoirs of energy. The push and shove becomes part of the big day out. The disciples reacted as you and I would have. What St Mark is telling us is that JESUS KNEW THE TOUCH OF FAITH. For me, the lady with the bleeding problem ranks with the greatest of the Bible’s heroes. Not only had she spent all her money on doctors “and was no better but rather grew worse”; she was banned from society, being “unclean” according to the law and custom of the day. She was lonely and sick. She was an outcast. I'm sure there were times when she wished she could die. This state of affairs might have continued, but someone told her about Jesus. About his love, about how he was going around teaching, preaching and healing - or she at least overheard people talking. This word about Jesus awakened her faith. By faith she could see that her life would be different if she got to Jesus. Surely he would do for her what he had done for so many others. She was determined to get to Jesus. But she had to avoid being noticed, because in her condition she could be stoned to death for touching anyone at all. She crawled through the crowd on the ground. She must have . . . because that's where she had to be to reach the hem of his garment. 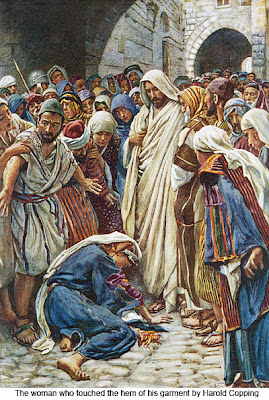 As she got closer she said to herself, “If I touch even the hem of his garment, I shall be made whole." Can't you just imagine her repeating these words over and over again as she strained and reached out with every ounce of strength she had left. That word of faith was her strategy to battle discouragement. Our problem is that when we are trying to break through to Jesus in a new way, we forget to keep on saying to ourselves the things we know to be true that will build up our faith. And discouragement crushes us. The lady in today’s Gospel did well with what she had. WE have so much more. We have God’s promises in both Old and New Testaments. We can repeat them under our breath - or even out loud - when we are struggling. And, you know, that can be therapeutic. It can help us to rise above despair, even when, humanly speaking, our prospects are dismal. THEN IT HAPPENED! The lady – against all the odds – actually made it to Jesus, touched the hem of his garment, and the bleeding stopped. The important thing for us when we receive Holy Communion, the anointing, or the laying on of hands, is to know that we really encounter Jesus. If we know that, we will be open to ALL the possibilities, including miracles. It's not "just" symbolic! In the Sacraments, Jesus is objectively present to share his life with us. We don’t “create” his presence by our faith. But, as with the lady in today’s Gospel, IT IS BY FAITH THAT WE DRAW ON THE BLESSINGS he has for us. Is everything going OK for you at the moment? Praise God if it is! But if like that lady you're as low as you can get, and you feel as if you might as well be dragging yourself along the ground through the dirt as she had to do, at least drag yourself in the direction of Jesus. And when you get yourself up to the altar rail for Holy Communion, I pray that you will draw on the healing power of Jesus in a new way, whatever your deepest needs, knowing that the Lord Jesus loves you more than anyone else ever has, and he wants you to break through to him afresh by responding in your hearts to his Word, and by touching the hem of his garment, expecting to be made whole, and that same surge of healing power will flow from him into you because he is the same, yesterday, today and for ever.